Do you have a young piano student that frequently confuses Bass B and Treble D? It’s one of the most common “note-reading issues” first encountered when a child begins on-staff note reading. Rather than moving on and adding more notes to your student’s repertoire (while hoping the confusion eventually clears), it’s a good idea to meet the B’s and D’s head on, providing strategies and practice that will banish any future frustration. In WunderKeys Primer Book One, Sheldon happily assists your student with learning “B vs. D” in a way that isolates these two notes and sets your student up for success. Today we’re sharing a printable you can use as an extension activity (use along with WunderKeys Primer Book One, Lesson 7) or as a review for students who need it. Click on the image below to download today’s printable. 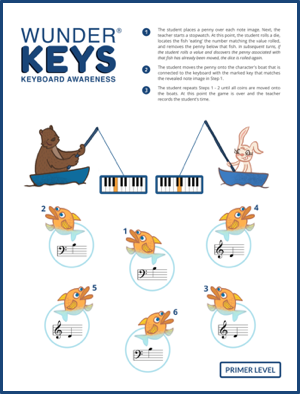 And don’t forget to check out our newly released WunderKeys Primer Piano Book Two!